I’ve been wanting to delve into some non-Western cinema for a while now, but it’s hard to A. know what’s good and B. find it with English subtitles. 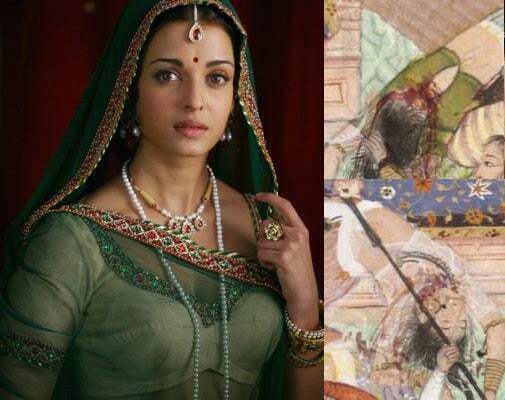 I have a thing for Aishwarya Rai (yes, because of Bride & Prejudice, which I adore), and for Indian history, so Jodhaa Akbar (2008) seemed like a good one to rev up. Now, I know very little of the specifics of Indian history (or the history of Indian dress), so I’m going to assume you need as much context as I did! Jodhaa Akbar purports to tell the story of 16th-century Mughal (i.e., Muslims from Central Asia, who ruled much of the region that is now India from 1526 through the 1850s) emperor Akbar the Great (aka Jalal-ud-din Muhammad, reigned 1556-1605) and his (first) Hindu wife, Mariam-uz-Zamani, later called Jodhaa (hence the movie title). It was a Big Deal that Akbar married a Rajput (clan) Hindu (apparently he was the first Mughal to do so) and, according to the movie, what started as a political alliance turned into a Love Affair and led to religious tolerance. 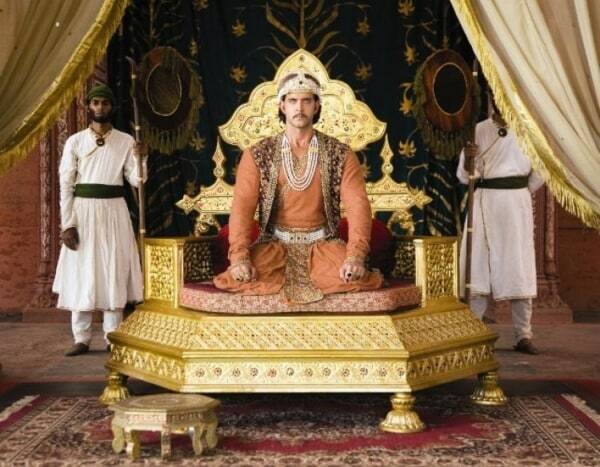 Akbar spends about 10 minutes of screen time taming an elephant, while Jodhaa’s father and various attendants wait for their audience. Apparently this is one of Akbar’s hobbies, but why a visiting noble has to watch is unclear. Jodhaa stumbles across this Manly Display of Manliness and is clearly all a-tingle. Also, from my rough-and-quick reading, it looks like the history isn’t too accurate. Yes, Akbar married a Hindu princess who came to later be called Jodhaa. 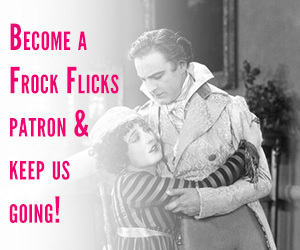 But in the film, she’s portrayed as 1. his only wife, and 2. the empress. 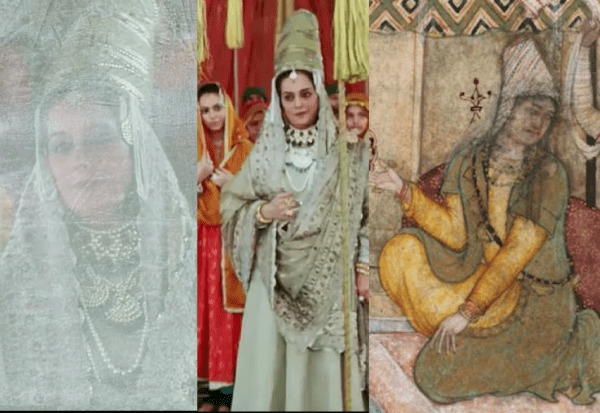 Actually, she was his fifth wife, and although she gave birth to his heir, it was Akbar’s first wife Ruqaiya Sultan Begum who was his empress consort and who was the most important of his 14(?) wives. 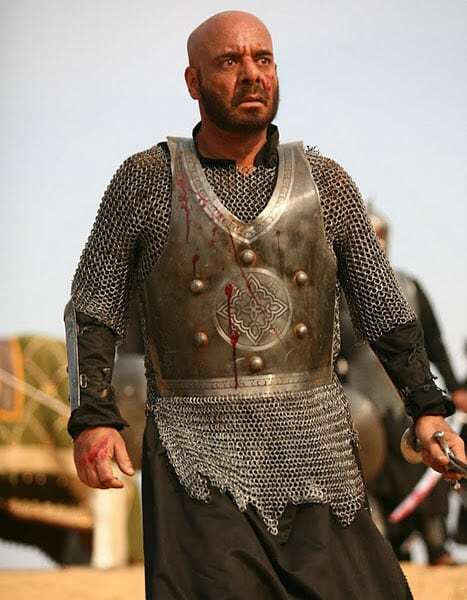 Finally, some of the characterizations were OTT, like Bairam Khan, the general/regent who raised Akbar and was alllll big buggy eyes and “let’s chop off their heads!” glee. In case you’re unclear who the baddy is, it’s the guy who really likes decapitating people. So while I’m interested in Indian dress history, I will freely admit to not knowing a lot about it. 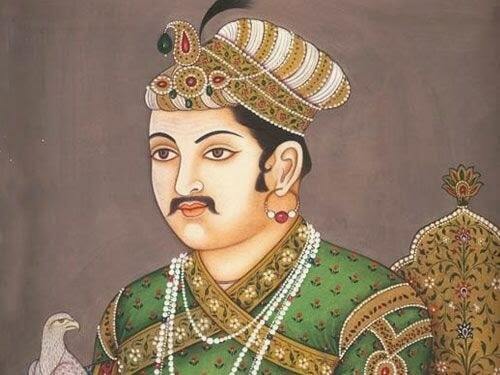 I did some quick reading and looked at a lot of images from this period — luckily Akbar commissioned an official history of his reign that is full of images of the actual people in this story, so it made it pretty easy to compare. “What made it easier was that everything was well researched. 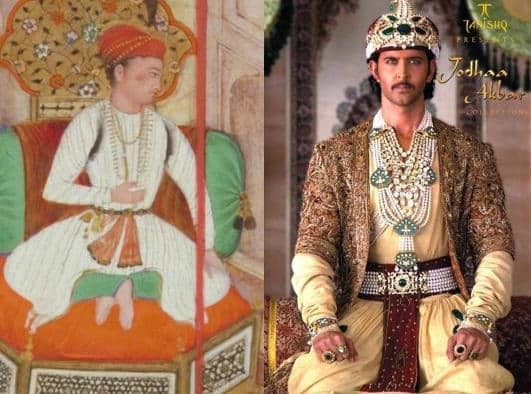 Even then, I worked on this project for a year and half because there was very little information available about the costumes and jewellery worn during that period … As the Mughal era was known for its grandiosity, we used a lot of warm tones though we were careful not to go overboard” (rediff news). 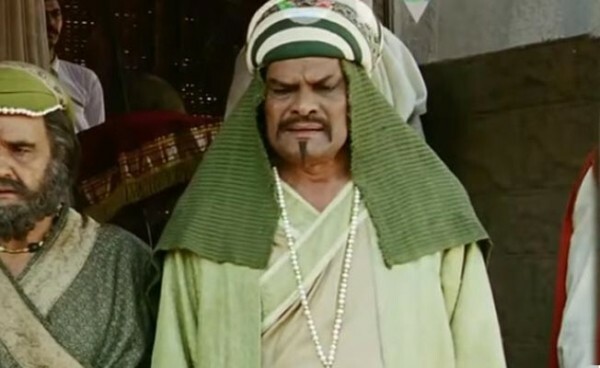 “Obviously, a lot of research went into it and Ashutosh had done a lot of detailed research for costuming and garments which he passed down to me. I did read this one particular book to go through Akbar’s life history and the events. We did refer to a lot of paintings of that era along with a lot of theory. We went to Jaipur to source the fabrics and the colour schemes to suit that time period” (Costumer’s Guide). Overall, the costumes — especially, but not just, the women’s — are STUNNINGLY beautiful. There’s beautiful fabrics, embroidery, and jewelry up the wazoo, as you might expect. First, let’s get the boys out of the way … although I mean that less than I usually do, because the men’s costumes are in generally REALLY pretty. High-cross-over robes with long fitted sleeves and below-knee-length skirtings. Court official, late 16th century, Victoria & Albert Museum. Underneath are tapered trousers. Frequently on top they wear open front, short sleeve, loose and open robes. 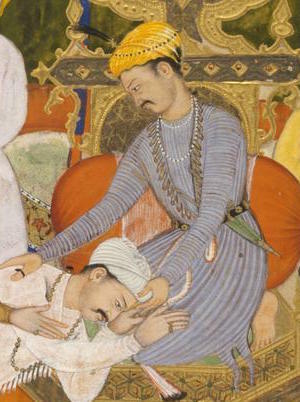 Detail from “Akbar and Delegation from the Governor of Nagor,” 1590-95, Victoria & Albert Museum. A sash is tied around the waist, with the ends hanging at the center front. 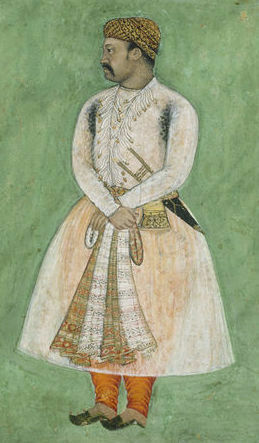 Zain Khan Koka, late 16th century, Victoria & Albert Museum. And turbans seem to be universal, at least from the images I’ve seen. Rai Surjan Hada making Submission to Akbar, 1590-95, Victoria & Albert Museum. Yep, the men are in the same high-cross-over robes, with loose, sleeveless or short-sleeve over-robes. That’s Akbar on the right, on the left is a Hunting Coat, 1620-30, Victoria & Albert Museum. There’s that center-front-hanging sash. The film costumes seem a lot more jeweled and embroidered than what I see in period art, but that could just be artistic license either way. On the left, that’s the real Akbar at the Marriage of Baqi Muhammed Khan, 1590-5, Victoria & Albert Museum. I didn’t notice a big difference between the Mughal characters like Akbar and the Rajput Hindu characters, like Jodhaa’s brother seen here. Lots of weedy mustaches, which are in the period artwork. So much embroidery, such beautiful textiles. The armor appears to check out, at least to my cursory glance. On the right, that’s Babur witnessing Muhammed Husain Mirza entangled in bedding, 1590-5, Victoria & Albert Museum. The main thing I took issue with were the turbans. Some of them, especially those worn by the Rajput Hindu characters, were OK. But the Mughal turbans (seen here) looked like flotation devices — weird padded tubes. 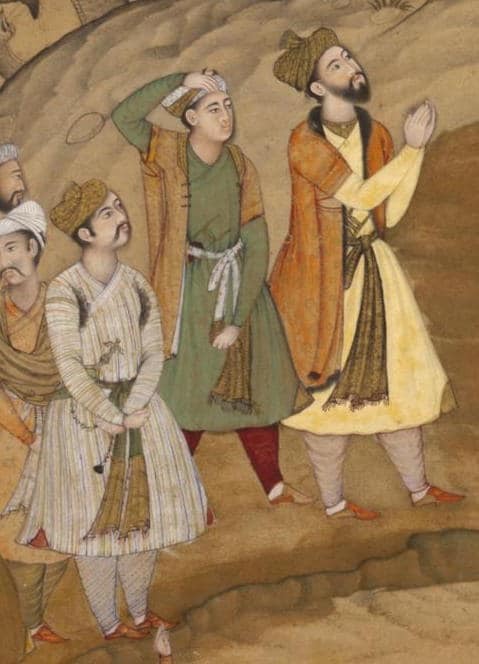 Compare them to all the details from 1590s turbans seen in Akbar-related artwork below. However, again, I know nothing about this era, so I’m fine with someone telling me they wore padded bike helmets. 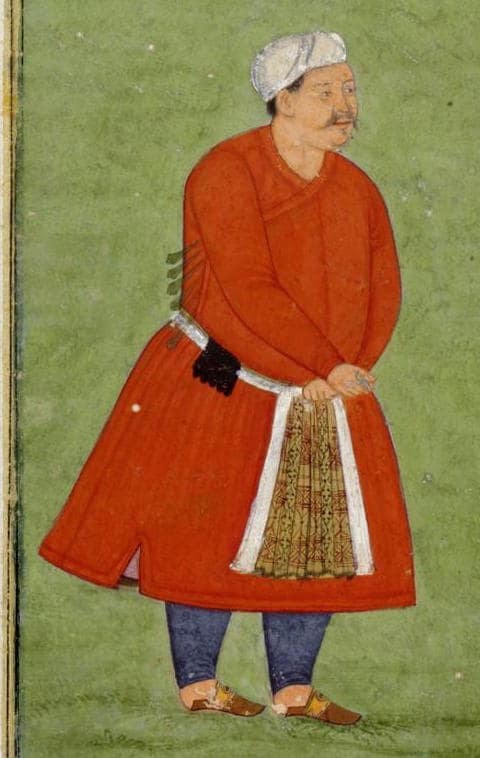 I did find this image, supposedly of Akbar, from which I can see the padded-bike-helmet inspiration. But I’d be shocked if this wasn’t actually a wrapped turban of some kind. Anyone know? Also, why did this guy have a dish towel under his padded bike helmet? Women wear saris over choli (short-sleeved, midriff-baring shirts), with tapered trousers underneath. Shawls (dupattas) are draped over the head. Two princesses entering a Muslim shrine, 1650-1700, Victoria & Albert Museum. Alternately women wear fitted robes with high, cross-over necks and below-knee-length skirtings, sometimes with more robes or saris or dupattas layered on top. The flight of Baz Bahadur ruler of Malwa, 1590-5, Victoria & Albert Museum. I’d love to know more about the degree of difference (if any) between the Mughal dress and Rajput dress. What I can tell you is what I spotted in the film, whether it’s historically accurate, I don’t know. There’s Jodhaa, still in her home country of Amer. The choli tops check out (the ladies on the right are being massacred, hence the weird positioning, but if you look closely you’ll see them) … except the cholis in the film looked SUPER seamed, almost like bras. Granted my knowledge of Middle Eastern/Asian clothing of this period is limited to the Ottoman Empire, but I’d be surprised if there was that much seaming going on in reality. A rare scene where you can see underneath. 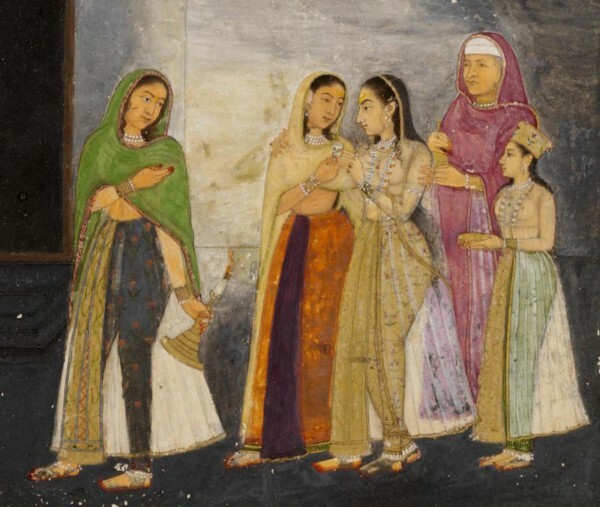 Akbar’s mother is center right in red, and sister is center left in grey and peach. Mom left (behind a veiling) and center, on the right is Reunion of Babar with his sister, Khanzada Begum, at Kunduz in 1511, 1590-5, Victoria & Albert Museum. That’s the real Maham on the left, and the character on the middle/right. Marriage of Baqi Muhammed Khan, 1590-5, Victoria & Albert Museum. I did question the fact that Jodhaa always went to sleep fully dressed, in full jewelry. That just can’t be comfortable. 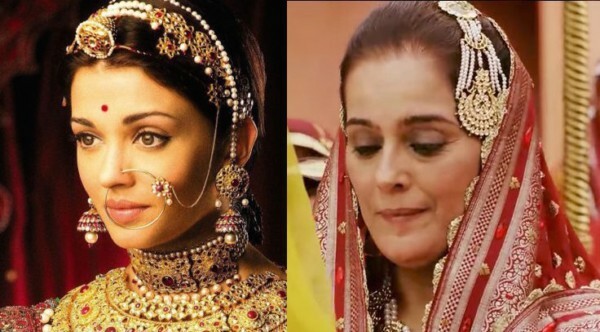 I noticed that the Rajput women (left) wore their focal head jewelry on the center part line, while the Mughal women’s (right) tended to be off to one side. Side note, I was thinking that this giant-nose-ring-connected-to-the-head-jewelry was an accident waiting to happen and was very relieved to discover that the nose hoop isn’t pierced, just clamped on. Phew! What can you tell us about 16th-century Indian costume? Got any good quality, easily-available-with-English-subtitles non-Western historic costume-y films to recommend? Thank you for this review! I know nothing about Indian history dress except that it’s beautiful. Same here, thank you for this! Our costume history classes covered Western costumes only. I have always wondered about other cultures, but where to start researching…. You are pretty modest about your knowledge on the subject, but it seems you already did a ton of research. This is a great read! Thanks! This really is just the tip of the iceberg, it’s something I’d love to spend some more time on! I would just like to point out that it seems extremely unlikely boqta contributed to the creation of hennin. (This claim originates, as far as I am aware, with the tumblr blog Medieval POC, quoting a single source “Secret History of the Mongol Queens” by Jack Weatherford, a claim just mentioned in passing, without any further elaboration – I have never encountered it anywhere else.) The continuous evolution of this headdress (hennin) is very well illustrated in period art. I’m late to this one, but hennins are tangential to one of my research areas (French Hoods). I was also skeptical of the “boqta inspired the henin” stance that The Smithsonian website just sort of tossed out there, because there’s essentially three plausible origins for the hennin and no academic (that I know of) has really come down on any one more firmly than the others. Option One: that the hennin and boqta sprang up independently of one another at around the same time. Tall hats have always come in and out of fashion throughout the centuries, across the world. Option Two: the hennin was inspired by the boqta, which coincides with the increased amount of cultural exchange between the Mughal Empire and Western Europe in the mid-15th-century (specifically Italy and Burgundy/Low Countries. Italy didn’t do hennins, but Burgundy sure did). Option Three: the boqta was inspired by the hennin, which coincides with the increased amount of cultural exchange between the Mughal Empire and Western Europe in the mid-15th-century. There’s way more evidence to support the Mughal influence on Western Fashion when it comes to caftans, which the Italians shamelessly appropriated into the zimarra, so it’s plausible. But I’m still not sold on it. 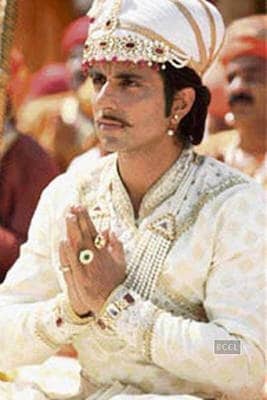 Jodhaa Akbar is one of my most favorite movies. I find many of the tropes in Indian film very entertaining, and it’s part of why I love this film so much. It has everything! Incredible sets, stunning costumes, fabulous music, and every time I watch it, I laugh. The first time I saw that scene where Jodhaa says she has some conditions for marriage, and it cuts to the emperor’s face and the music goes “Baaa- WHAAAA Dun Dun DUUUN! !” I laughed so hard I had to pause the movie. And it still gets me. I was initially confused about why they had a 10 min elephant scene, but I did some research and apparently Akbar was SUPER into pachyderm-based extreme sports. I love this movie. Thanks for the review. ” pachyderm-based extreme sports.” That made me giggle. Excellent turn of phrase! glances sideways I know a kitkat who’s into “cushion-based extreme naps” lol! I feel the need to work “pachyderm-based extreme sports” into a conversation someday. Or a variation thereof. Brilliant! 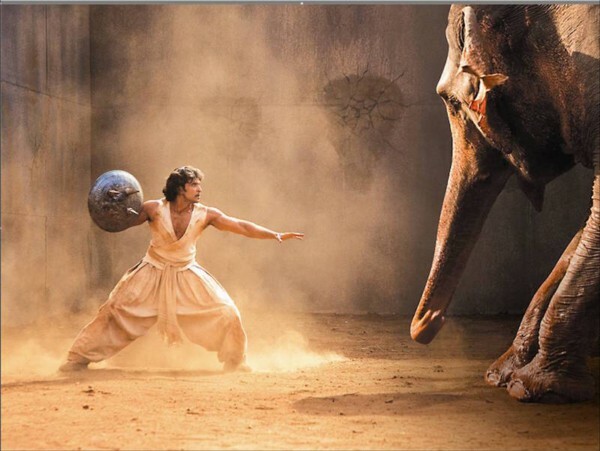 Yeah, the lengthy shirtless elephant scene was definitely to show off Hrithik Roshan’s gorgeous physique. And the overly-seamed choli was probably to give Aishwarya Rai-Bachchan’s endowments a little lift. 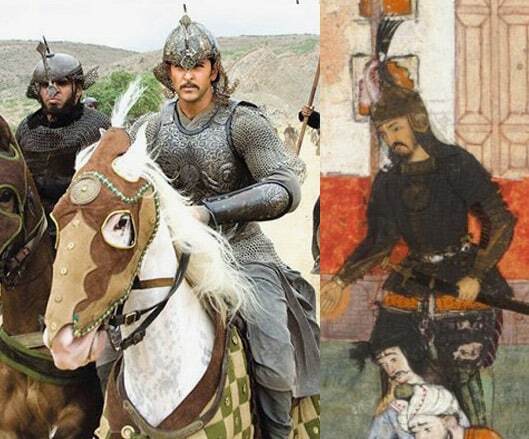 Bollywood does take liberties with history to showcase the attributes of it’s stars (just like American cinema). I was too distracted by his pretty eyes, but upon closer inspection, WOW. If I had that physique, I’d be showing off too. Lagaan is my favorite historical Indian movie. It’s set during the colonial era. However, the costumes on the single female English character are TERRIBLE. I want to fast-forward every time she’s onscreen. 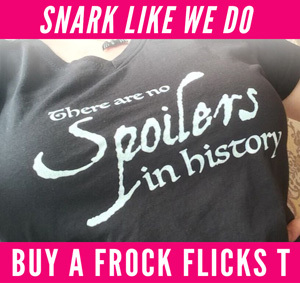 So snark away if you review it. Mangal Pandey: The Rising is also a pretty good colonial era story–and it has Toby Stevens, which is always a plus. And Devdas (early 1900s) has gorrrgeous costumes and dancing and cinematography, and more Aishwariya. But it’s one of those stories that makes you want to die by the end. I’m afraid there’s no escaping the OTT Bollywood tropes. You just get used to them and learn to laugh at the ridiculousness, while appreciating that, for once, the men are as objectified as the women. There are some great ones from South India too, but they are even more OTT because their storytelling form hasn’t been as influenced by Western cinema as Bollywood has. Magadheera (a reincarnation fantasy, part-modern, part-1600s) is fabulous, and I hear Baahubali is, too. Yes, Lagaan is excellent- and it’s the same director and composer as Jodhaa Akbar! The pair came out with a third film last year called Mohenjo Daro, and it was hilariously terrible and campy. I loved it, but mostly because I couldn’t stop laughing at how over the top ridiculous everything was. I’ll just say ‘Lisa Frank Unicorn Goat’ and leave it at that. Ooh, I haven’t watched any Bollywood in a while, but I may have to check out Mohenjo Daro! A.R. Rahman is my spirit animal. I love me some Swades, too. I hope Gowariker hasn’t completely lost his mojo since Jodhaa Akbar! Ah yes, Devdas! Cried my eyes out at the end. Heart-wrenching but oh so beautiful. First of all, thanks for this. It’s gorgeous. I’m going out on a limb to state that the more covered Mughals were Muslim (and the Koran declares that men & women should dress modestly), while the others were Hindu, with no such proscription. A few years back, there was an exhibit here about Sulieman the Magnificent, who lived slightly before the time frame of the film. There were a bunch of textiles, including embroidered silk robes that glowed across the room. The reason for that was because the silk embroidery thread was wrapped with gold or silver that gave it the glow. Unbelievably beautiful. Almost a religious experience. The part of a saree that is left loose after it is draped is called the Pallu. A dupatta is a completely separate piece of fabric from the blouse/choli/kameez and ghagra/lehenga/ salwaar. There are theoretically infinite ways of draping a pallu, but it’s interesting to note that the sarees in the film are draped in the gujarati style (the pallu wraps across the back and is pinned to the right shoulder so it falls over the chest to end at the hips), rather than in the nivii style that is most common (the pallu is draped across the chest and pinned on the left shoulder, from there it hangs loose). The chain and pendand worn down the center of the head is a tikka (maang tikka if the chain is a significant design element), and the one worn to the side is a pakistani originating piece known as a jhumar. This is very interesting! Thank you for your insight! Great review! 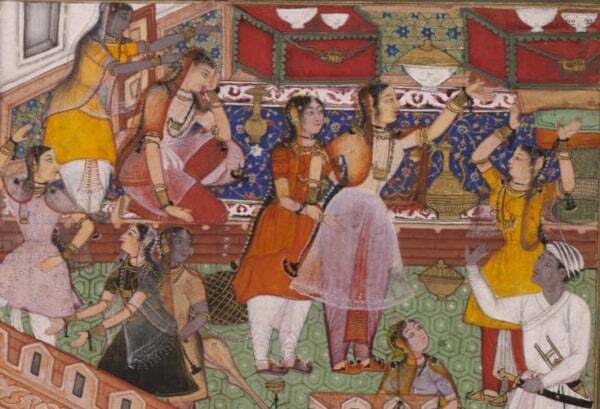 The rajput women are actually wearing lehengas or ghagaras (a type of skirt) with a choli and dupatta (veil). The musical numbers in Bajirao Mastani were breathtaking, but I couldn’t handle the plot or characters. I only got halfway through. But the songs and costumes WERE fabulous. Devdas is next on my list! The costume designer for Bajirao Mastani, Anju Modi, also did another one of Sanjay Leela Bhansali’s films, Ram Leela. It’s based on Romeo and Juliet, but it’s not a period piece. The costumes are still pretty mind blowing though! Mangal Pandey: The Rising is also a pretty good colonial era story–and it has Toby Stevens, which is always a plus. I’ve seen that. It’s okay. Where can I watch this? I’ve YouTube, Starz, Hulu & Netflix. I found it — in high res! — on YouTube! Thanks now to figure out which YouTube entry is in English & I don’t have to click on something that I don’t see. Seeing this review touched my soul. I am a huge fan of Bollywood, an even bigger fan of it’s history. If you enjoy period films of a Bollywood persuasion, you HAVE to watch Mughal-e-Azam, Pakeezah, Umrao Jaan both the original and Aishwarya remake. Yes they are over the top but the scripts and music make them iconic and the costumes are to die for!! I always keep these looks in mind whenever I have Shalwar Kameez suits made. I loved this review. I’ve recently read this book to get a bit more background on Indian film, just in case people are interested: http://annorlundaenterprises.com/books/dont-call-it-bollywood/ It’s got some really good recommendations and I loved learning more about why they have such drawn-out scenes and the symbolism involved. 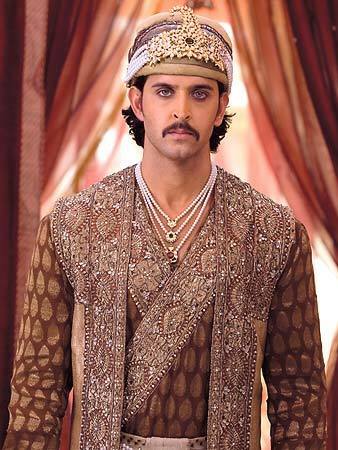 I’m just here to marvel at how gorgeous those lead actors are, especially Hrithik Roshan (Akbar). My oh my. Jodhaa Akbar – LOVE IT! Thanks for the thoughtful review. My favorite part actually is the devotional song Khwaja Mere Khwaja. Are they ?whirling? dervishes? don’t know, but it’s mesmerizing! Time for 3+ hours of DVD magic for me again! I am astonished by you’re fashion perception. You didn’t even study Indian history that much, it’s a complete diffferent culture, but you caught on to historical costume traditions effortlessly(and amazingly). You are a TRUE historical fashion expert. Great job! You have a gift! 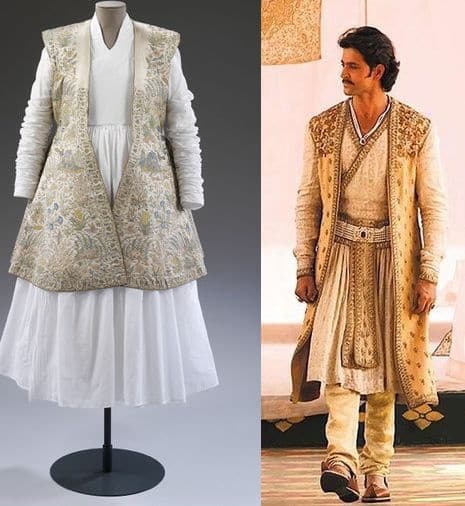 I think the reason why Bollywood costume designers take liberties with historical accuracy so confidently is because we pretty much still wear the same sort of stuff today too. We wear both western clothes and cotton, casual, but traditional Indian clothes on a daily basis, and for special occasions glam up. Of course not to the extent of these royals on screen, but most of us pretty much have a good idea of how historical costume looked because it isn’t too far off. Craploads of gold and jewels is still a must today. No matter the strata Indians will splurge on gold and jewels like westerners would for the latest designer handbag/shoes and be thrifty in other areas. I think designers kind of have an intuition of what works what what doesn’t. Expect for the men’s costume, where they would need to be a little careful. And not to mention fashion trends were a lot more creative/colorful and impromptu than western historical fashion trends. Western historical costume designers have to be crazy meticulous not to screw up because of such specific fashion trends of the past that we’re so out of touch with today(otherwise they should expect to be schooled by FrockFlicks lol.) Whereas in Bollywood, a lot of things will ‘roll’. Fashion’s been literally the same for centuries in India lol.. at least before the British rulership that is. This movie came out when I was like.. 10. And can’t even count how many times my mom made me watch it lol. Btw, Devdas was really big. Bigger than this movie, definitely “Titanic” status in India lol. But a tear jerker. Also, most Indian styles are kind of worn all over the country now. But gagra choli and stuff was really popular in the West. Wearing the sari draped over the head and holding it like that to shade their face like you said is a Rajistan thing. Wearing the saree draped from back to the front was a Gujarati thing(west). Front to back is done over the rest of India, mainly the south (where I’m from) though. The south is known for all kinds of silks and sarees while in the North they usually wear more salvars nowadays. When I go to India, I love love love to wear Anarkalis, because the ‘western historical costumes freak’ in me loves how it accentuates the waist, and hides the lower body(the thighs/hips thankfully). It covers my pear shape perfectly. 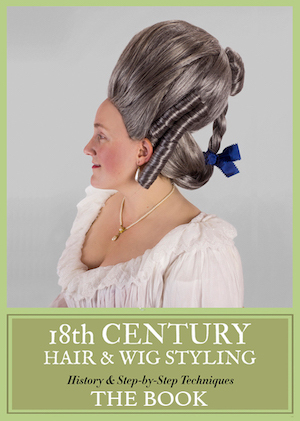 That’s why I specifically love 18th century fashion anyways. And another fun fact: people only started wearing blouses these last centuries. In ANCIENT India, they would just mainly wear sarees without the blouse, and the guys Dothi without shirts usually. The main point was to get the job of covering up done with one piece of fabric.. and depending on occasion, either wear a glam fabric with jewels or casual fabric for normal days. I love the ‘toga’ look of sarees. It looks really graceful and flowing. Especially the crepe silk ones. Americans go crazy for those when my mom wears them here. Most Indian female protagonists I know, either in TV shows or movies, go to bed in full costumes, jewellery and make-up, LOL.